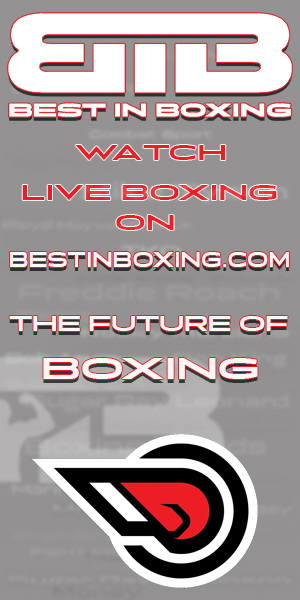 For years boxing promoters and TV networks have force fed boxing fans the slow moving heavyweights. It appears Showtime is out to buck that trend and on Saturday night they introduced their viewers to four outstanding boxers from the Bantamweight division in a winner take all tournament. Following in the footsteps of their highly touted Super Six Middleweight Tournament, Showtime hit another one out of the park by selecting Jonnhy Perez, Abner Mares, Vic Darchenyan and Joseph Agbeko as their participants. On Saturday night, the four gents showed up for work in magnificent condition with their skills honed to perfection. In bout number one, the 25 year-old Mares (21-0-1, 13 KOs) faced off against the 34 year-old veteran Darchinyan (35-3-1, 27 KOs) in a bout that has to be right up there with the fastest paced championship fights ever. It was 12 rounds filled with high drama. Round one, Mares sustained a bad cut over his left eye after their heads clashed. Then just before the bell sounded to end round two, Darchinyan caught Mares with a straight left to score a flash knockdown. It was the first time he had ever been knocked off his feet. To cap off Mares’ adversity-filled start, referee Bobby Howard deducted a point from him in the fourth round for consecutive low blows. Just like in that book you had to read in high school, The Red Badge of Courage, the combination of blood streaming down Mares’ face and that point deduction changed his whole demeanor. From that point on, he showed little concern for himself and became a stalker, power puncher, able to withstand anything thrown his way, even Darchinyan’s powerful left hand. Then in the seventh round, Mares knocked an off-balance Darchinyan down with a straight jab. At that point it appeared the tide had turned and Darchinyan was now in retreat mode. Even though he tried to hide the fact, it appeared that his energy had started to fade. In the final round Darchinyan was desperate just to hold on for dear life. By winning the later rounds, the gap in the scorecards vanished and the well-conditioned but bloody Mares did just enough to win an exciting split decision victory with scores of 115-111 and 113-112 for Mares and 115-111 for Darchinyan. 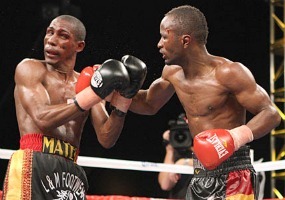 Saturday evening, December 11, 2010, Joseph Agbeko (right) lands a powerful right cross on the chin of his opponent Jonnhy Perez (left) in their world championship bout aired on Showtime. In the co-main event Joseph Agbeko (28-2-0, 22 KOs) faced Yonnhy Perez (20-1-1, 14 KOs). In this one, Agbeko dictated the fight’s direction through the early rounds with hard right hands and quick combinations. 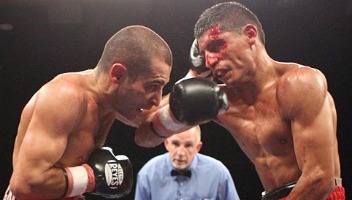 By the fifth round, Perez, the defending champion, had a cut over his left eye and began to fight with more urgency. Then in the sixth round, he turned the bout into a slugfest as the punches flew at an alarming pace for three full minutes. Midway through the seventh round, Agbeko was back to working his game plan and had regained control of the fight. In the end, the judges scored the bout 115-113, 116-112 and 117-111, all in favor of Agbeko to hand Perez his first career loss. Showing not a speck of ring rust after a 13-month break from boxing, Agbeko’s victory not only put the IBF title back in his possession but it earned him the spot in the tournament’s finals against Mares. Not to give Perez an excuse, but over the same 13 months, Perez was involved in three hard fought 12 rounders. 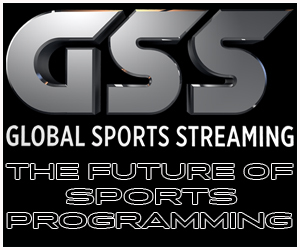 Thus far the tournament has delivered just what it promised: exciting, competitive and compelling fights for their viewers. It will be interesting to see how Perez and Darchinyan will fair in the consolation round after their tough losses. The replay of Saturday night’s telecast is set to air Tuesday, Dec. 14 at 10 p.m.